The Cardijn Community of Australia together with Catholic Theological College and the University of Divinity are calling for papers for a Symposium on “Formation, Laity, & Vatican II: The YCW in Australia” which will take place at CTC, Melbourne on Saturday 29 July 2017. 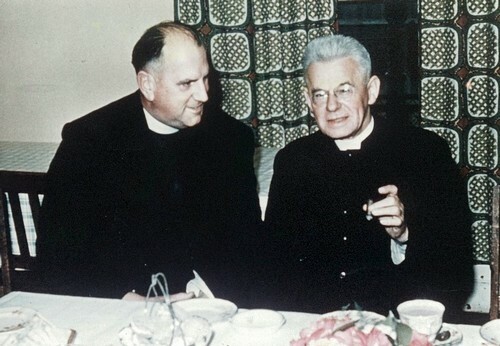 The conference will also mark the 50th anniversaries of the deaths of Joseph Cardijn (24 July 1967) and Fr Frank Lombard, founding chaplain of the Australian YCW, who died four days later on 28 July 1967. The YCW was the ‘most significant lay movement in twentieth century Catholicism’, declared Australian church historian Edmund Campion in his book Rockchoppers. The Australian YCW was notably an initiative of the laity (the Melbourne Campion Society, and the Grail), whose schemes were adopted by the bishops and from 1941 developed by a priests committee with lay financial support. In later years lay adult ‘collaborators’ replaced religious chaplains. Many YCW leaders surrendered years, and sometimes careers, to the compelling vision of the YCW. Many religious vocations were shaped significantly by YCW exposure. Australia’s YCW is a potent story of clergy and laity in a vital, undulating, working relationship. In 2017 we commemorate the 50th anniversaries of Cardinal Joseph Cardijn and national chaplain Fr Frank Lombard. It is also the 25th anniversary of Msgr John F Kelly, YCW author, editor, and pre-Cana leader, and the 20th anniversary of Fr Hugh O’Sullivan, YCW author, and Adelaide, Australian and Asia-Pacific YCW chaplain. We are calling for short (20 minute) scholarly presentations. We will also welcome expressions-of-interest for non-scholarly presentations on, for example, experiences with a particular chaplain, YCW/NCGM training weekends, or broader thoughts on formation. It is anticipated that some papers will be published. While the forum will look at the role of chaplaincy and lay formation in the YCW, it will also provide opportunity for wider reflection on lay formation and mission in the Australian church today. It is anticipated that it will be a prelude for a larger conference on the YCW to be held in 2018.